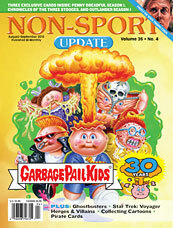 This entry was posted in GPK 30th and tagged GPK 30th, Magazine, Non-Sport Update by Jeff. Bookmark the permalink. ← Previous Previous post: New Garbage Pail Kids Binders Incoming? Next → Next post: How Many 30th GPK Cards Were Produced?